Sarah DeRemer Knauss (née Clark; September 24, 1880 – December 30, 1999) was an American supercentenarian. Knauss is the oldest person ever from the United States, and widely reported as the second-oldest fully documented person ever. She was recognized as the world's oldest living person by Guinness World Records from April 16, 1998, until her death. Sarah DeRemer Clark was born on September 24, 1880, in Hollywood, Pennsylvania, a small coal mining village. She married Abraham Lincoln Knauss in 1901; he became a prominent Lehigh County, Pennsylvania Republican leader, and the recorder of deeds. Their only child Kathryn was born in 1903 and died in 2005 at the age of 101 years. Sarah's husband died in 1965 at 86 years old. In 1995, Knauss said she enjoyed her life because she still had her health and could "do things." 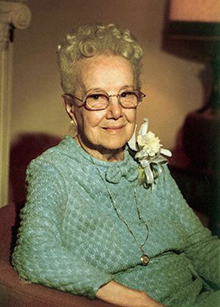 At age 116, Knauss was recognized as being the new United States national longevity record holder, then thought to have been Carrie C. White (reportedly 1874–1991). In 1998, she became the world's oldest person when 117-year-old Canadian Marie-Louise Meilleur died. When her family members mentioned her newfound fame, Knauss responded with a smile and "So what?" Prior to her death, there were six living generations in her family. Knauss died of natural causes on December 30, 1999 at the Phoebe Home in Allentown, Pennsylvania, where she had lived for the final nine years of her life. 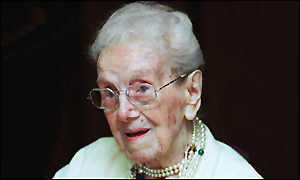 Of her death, state senator Charlie Dent, who had attended her 115th birthday party in 1995, said, "Mrs. Knauss was an extraordinary woman who pushed the outer limits of longevity. This is a sad occasion, but she certainly had an eventful life." ^ One source erroneously reports her date of death as December 31, 1999. ^ a b c d e f g Merrill, Gary F. (February 3, 2015). Our Aging Bodies. New Brunswick, New Jersey: Rutgers University Press. ISBN 9780813575261. Retrieved December 7, 2015. ^ a b Devlin, Ron (January 1, 2000). "Sarah's Century". The Morning Call. Retrieved April 17, 2017. ^ Newton, Christopher (December 31, 1999). "Sarah Knauss, world's oldest person, dies at 119". Athens Banner-Herald. Online Athens. Retrieved October 25, 2014. ^ "Nothing Fazes Oldest Woman". Associated Press. April 19, 1998. Archived from the original on May 16, 2011. Retrieved December 9, 2007. ^ "World's oldest person dies. She is the oldest verified American in history". The Guardian. London, England. January 1, 2000. Retrieved December 9, 2007. ^ "Sarah Knauss, World's Oldest Person Dies at 119". The Nevada Daily Mail. Harrisburg, Pennsylvania. Associated Press. December 31, 1999. Retrieved December 5, 2015. ^ a b "World's oldest person misses millennium". CNN via WebCite. Retrieved March 23, 2008. As one of very few people who have already seen one century roll over to the next, she would probably not have made a fuss about the arrival of the year 2000. ^ Harris, Timothy (2009). Living to 100 and Beyond. Winsted, CT: ACTEX Publications. p. 85. ISBN 1566986990. ISBN 9781566986991. Retrieved December 6, 2015. ^ Newton, Christopher (December 31, 1999). "Sarah Knauss, World's Oldest Person Dies at 119". Lakeland Ledger. Harrisburg, Pennsylvania. Associated Press. Retrieved December 5, 2015. ^ a b Devlin, Ron (December 31, 1999). "Sarah Knauss, oldest person, dies at 119". The Morning Call. Retrieved February 18, 2013 – via Genealogy.com. ^ Frassinelli, Mike (September 25, 1999). "Mrs. Sarah Knauss, the World's Oldest Person, Turns 119". The Morning Call. Retrieved January 23, 2019 – via GRG.org.